Bhikkhuni Dhammamitta was the first Theravada novice (Samaneri) and Bhikkhuni of the northeastern region of Thailand . 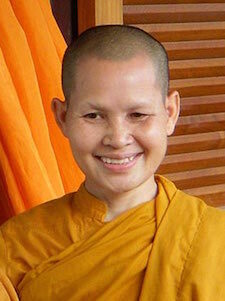 She is a prominent daughter of the Buddha who is actively reviving the Bhikkhuni Sangha in Thailand . Bhikkhuni Dhammamitta built her own temple, and arranged for the ordination of six other Thai Samaneris. The Venerable Bhikkhuni Dhammamitta is not only socially-engaged, but is also an adept in Abidhamma, Buddhist Psychology. Bhikkhuni Dhammamitta is the first ordained Thai woman who can recite the Bhikkhuni Patimokkha in Pali by memory just as in the ancient days. From the plain and simple rice fields of Thailand ’s northeastern region to the hustle and bustle of Bangkok , Dhammamitta Bhikkhuni spreads love and kindness everywhere she travels.